• Occupation: Railway factory Labourer, 15 Mar 1920, Ashford, Kent, England. 10 From John Bertram's birth. Was supposedly a Railway Inspector at some point. 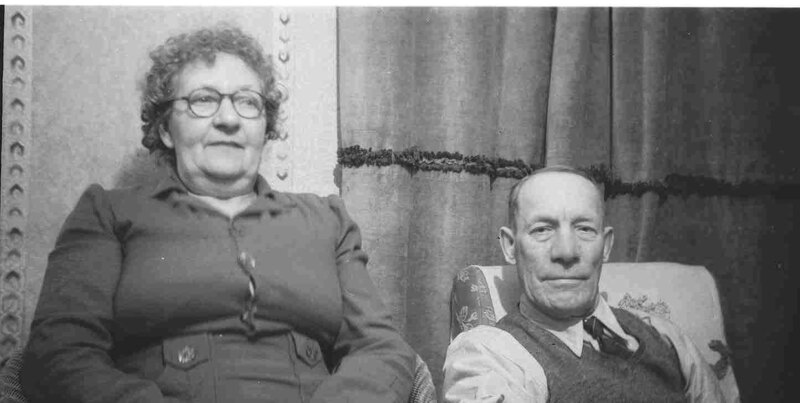 Bertram married Louisa (Lucy) Jane Baldock, daughter of Edmund (Edwin) Baldock and Mary Ann Butler, on 2 Jun 1909 in Willesborough Parish Church, Ashford, Kent, England.1 2 (Louisa (Lucy) Jane Baldock was born on 2 Nov 1884 in Rye Foreign, Sussex, England 11, christened on 7 Dec 1884 in Parish Church, Rye, Sussex, England 12 and died on 22 Jan 1954 in 107 Gladstone Road, Willesborough, Kent, England 13.) The cause of her death was Natural (Coronary Thrombosis). 3 Birth Certificate, Certificate held by G. Goldsmith. 4 Death Certificate held by Graham & Sandy Goldsmith, Dec Q 1966, Ashford, vol 5f, p.11. 5 Graham Goldsmith, "Ralph Lewis Mills Corres.". 6 1891 Census - 5/6 Apr 1891, RG12/700, fol.134, p.10. 7 1901 Census - 31 Mar/1 Apr 1901, RG13/784, Fol.54, p.2. 8 Marriage Certificate, From Marriage Cert. 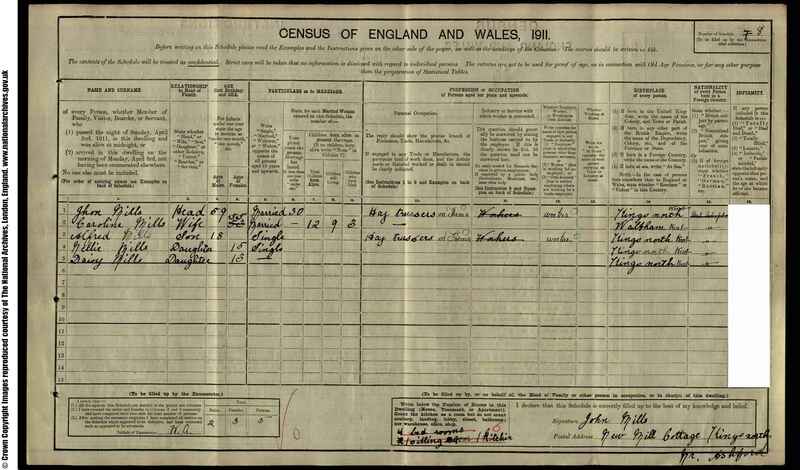 9 1911 census of England; digital images; citing RG 78, RG 14 PN PN170, registration district (RD) RD56, sub district (SD) SD1, enumeration district (ED) ED14, schedule number (SN) SN164. 10 Birth Certificate, From son's birth cert. 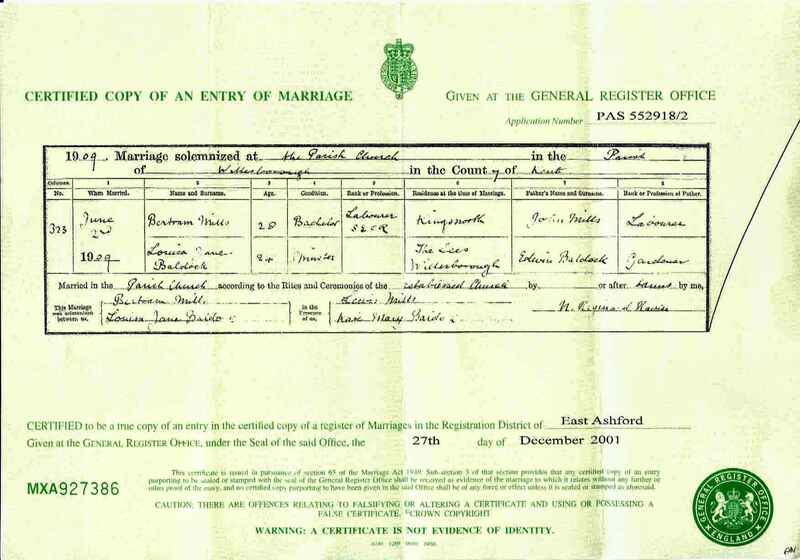 11 Birth Certificate, born Dec Q 1884, Rye. vol 2b, page 5. 12 BVRI 2, From BVRI2, FHL Film 1468918. Also Batch No. C148365. 13 Death Certificate held by Graham & Sandy Goldsmith, Age 69, Ashford, vol 5b, page 15, Jan 1954.